The Mississippi River Trust is a nonprofit, charitable conservation organization working with willing private landowners and government agencies to conserve fish and wildlife habitat in the Lower Mississippi River region.. The Mississippi River Trust is engaged in habitat conservation, conservation education and conservation policy. The Mississippi River Trust (MRT), a charitable, nonprofit conservation organization established in 2002, focuses its work on habitat conservation, conservation education and conservation policy. Habitat Conservation: We encourage landowners in the Lower Mississippi River region to donate land and interests in land for conservation purposes. We also acquire and hold title to land and conservation interests to improve and protect water quality; to enhance and protect wildlife populations; and to improve local economies through nature-based recreation. Our primary tool for land conservation is a conservation easement. It is an alternative to selling land for development. A conservation easement allows a landowner to retain ownership of the land, protect important environmental or historical assets of the land from future development, and obtain certain tax advantages. Many of our habitat conservation projects, including the Lower Mississippi River Batture Reforestation Project, focus on the active floodplain of the Lower Mississippi River, an area of 2 million acres of land and water from Cairo, Illinois, to Baton Rouge, Louisiana. Conservation Education: We promote a broader knowledge of conservation options and stewardship of the region’s natural resources through landowner workshops, field days and Internet resources such as the Conservation Finance Center. Conservation Policy: We work with government agencies and other private entities to address and solve the region’s conservation challenges through legislation, federal appropriations and the development of innovative programs. The Mississippi River Trust works with private and government partners to protect, restore or enhance bottomland forests and other wetland and riverine habitats, focusing on the active floodplain of the Lower Mississippi River. The Mississippi River Trust (MRT) works with private and government partners to protect, restore and enhance bottomland forests and other wetland and riverine habitats, focusing on the active floodplain of the Lower Mississippi River. 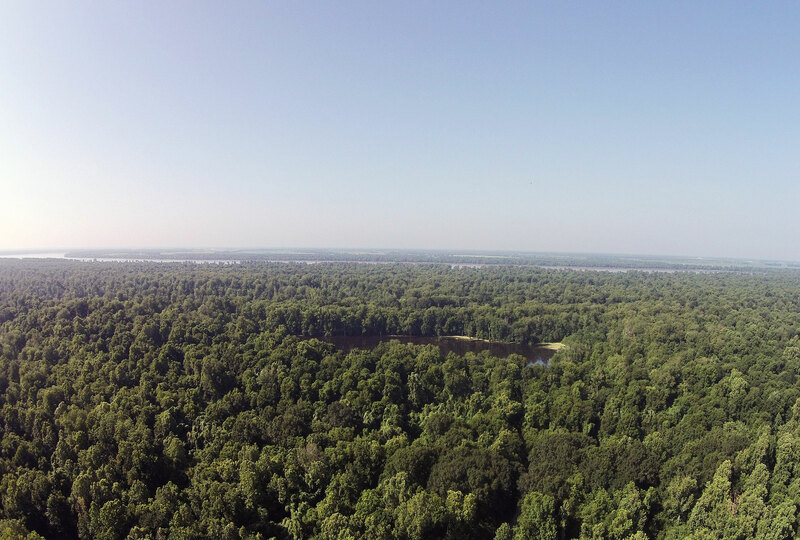 Through our Lower Mississippi River Batture Reforestation Project, we are promoting more sustainable land and water management in the 2-million-acre active floodplain, also known as the “batture,” of the lower river. Working with the Lower Mississippi River Conservation Committee (LMRCC), Bear Trust International the Natural Resources Conservation Service we have a goal of enrolling 20,000 acres cleared land in Wetland Reserve Easements by 2020. Land already enrolled is being replanted in bottomland hardwood forests to protect water quality, expand wildlife habitat, improve flood control and provide other benefits. The MRT holds conservation easements on 49,873 acres of private land. Conservation easements are one of the newest and most owner-friendly tools available for private landowners wishing to preserve or promote a certain conservation ethic on his or her property. In donating a conservation easement to the MRT, a landowner agrees to restrict certain property uses, such as subdividing land for residential or commercial development. In return, a landowner typically receives certain tax benefits. The MRT supports in-stream restoration along the Lower Mississippi River. The MRT, LMRCC and the U.S. Army Corps of Engineers are working to restore and maintain flows in the river’s side channels, which are important habitat for fish, birds and other wildlife, including the endangered pallid sturgeon, interior least tern and fat pocketbook mussel. So far, more than 82 miles of side channel habitat have been rehabilitated, and more work is underway. The Mississippi River Trust hosts workshops and field days and develops Internet resources for landowners and others. Our workshops and field days focus on the benefits of conservation easements, conservation programs such as Wetland Reserve Easements and the Conservation Reserve Program, and other topics. These events are attended by landowners, elected officials and agency officials. With Wildlife Mississippi the Mississippi Land Trust, and partners Yale University School of Forestry and the Walton Family Foundation, we developed the Conservation Finance Center to assist private landowners in making conservation decisions based on sound economics. With this website, a landowner can make a comparative financial analysis of land uses to visualize the economic results of undergoing certain conservation practices. Two decision-support tools focus on analyzing participation in the Conservation Reserve Program and Wetland Reserve Easements, both of which offer federal payments for implementing reforestation of cleared wetlands and other conservation practices. The Mississippi River Trust works with members of Congress and other decision-makers to promote conservation policies that are innovative and cost-effective. Our work benefits both public and private lands in the Lower Mississippi River region. The Mississippi River Trust (MRT) works with members of Congress, government agencies and other decision-makers to promote conservation policies that are innovative and cost-effective. Our work benefits both public and private lands in the Lower Mississippi River region. Supporting provisions of the federal Farm Bill that promote the conservation of bottomland hardwood forests, wetlands, and other habitats on private lands. Such programs include Wetland Reserve Easements and the Conservation Reserve Program. Of the approximately 2.7 million acres presently enrolled in Wetland Reserve Easements nationally, nearly 700,000 acres have benefitted populations of wetland-dependent wildlife in Arkansas, Louisiana and Mississippi. The program’s continued reauthorization in the Farm Bill can, and should, continue to serve fish and wildlife resources throughout the nation, and especially in the Lower Mississippi River region. Supporting adequate federal funding for conservation programs and conservation agencies such as the U.S. Fish and Wildlife Service, the U.S. Forest Service and the Natural Resources Conservation Service. Federal spending on natural resource, environmental and conservation programs as a portion of the federal budget has dropped from four percent in 1982 to about one percent today. Supporting the creation and expansion of public lands, especially National Wildlife Refuges, as well as new interpretative facilities. Working to develop tax incentives for the recovery of threatened and endangered species on private lands as well as tax policies that encourage the use of conservation easements on private lands. The MRT is working with the Land Trust Alliance and other organizations to ensure that we maintain tax incentives that bolster voluntary land conservation while protecting the heritage and livelihood of farmers and other landowners.